Prescription and OTC drugs can be dropped off 24 hours a day at the Zion Police Department, 2101 Salem Blvd, Zion, IL 60099. Most people take medicines only for the reasons their doctors prescribe them. However, an estimated 20% of people in the United States have used prescription drugs for non medical reasons. This is prescription drug abuse and it is a serious and growing problem. Disposing of drugs through the water method (e.g., flushing them down the toilet) can cause environmental damage and simply throwing them away is no guarantee that animals, or people, won’t come in contact with them. 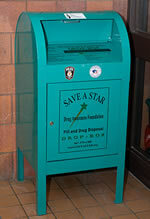 Medicines should be placed in the sea foam green collection box (which looks like a mailbox), where they will be securely held until being turned over to the DEA for destruction. Drug Take-Back Day is a great opportunity for those who missed the previous events, or who have subsequently accumulated unwanted, unused prescription drugs, to safely dispose of those medications.